We are a leading Manufacturer of woven geotextile fabric for river canals from Ahmedabad, India. We are engaged in providing a wide range of Woven Geotextile Fabric. These are manufactured keeping in mind the environmental factors and hazards. Hence, we use superior grade natural jute for manufacturing the range as per the industry norms. Owing to the high grade raw material and latest technology. 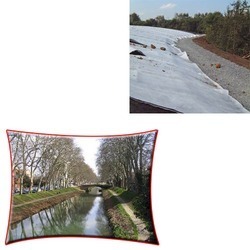 Looking for Woven Geotextile Fabric for River Canals ?